58. For transmitting three different speeds by gearing. The lower part of the band is shown on a loose pulley. The next pulley is fixed on the main shaft, on the other end of which is fixed a small spur-gear. The next pulley is fixed on a hollow shaft running on the main shaft, and there is secured to it a second spur-gear, larger than the first. 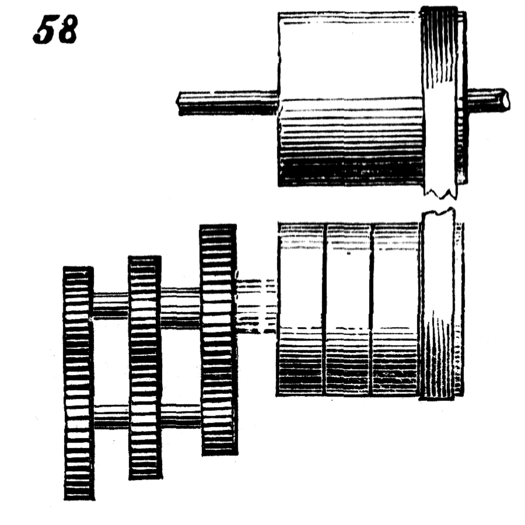 The fourth and last pulley to the left is fixed on another hollow shaft running loosely on the last-named, on the other end of which is fixed the still larger spur-gear nearest to the pulley. As the band is made to traverse from one pulley to another, it transmits three different velocities to the shaft below.